Men and women have adorned themselves with jewelry since long before the age of reason! Garlands of flowers, bracelets of woven grass, shells, and stone; such were the first decorations to beautify the human body. We may have been wearing jewelry as far back as 75,000 years ago - 30,000 years earlier than previously believed - according to a recent report by National Geographic News. Over the millennia, jewelry styles and materials have evolved in step with the advances of civilization. From the Stone Age to the Bronze Age, from the Iron Age to the Industrial Revolution (and seemingly back again! ), jewelry styles have transformed, modernized, and then often returned to their most basic forms and essential elements. So, too, has the significance of jewelry evolved through the ages. Fundamentally, jewelry has always remained an adornment, but an adornment that variously transformed into a symbol of love, religion, wealth, prestige, rank, class, and sometimes authority. Historically, rings in particular have held significant import beyond mere physical enhancement. Clergy prized "heavenly" blue sapphire rings. Signet rings have served as official seals. Others have considered rings as icons of physical and spiritual protection, bearers of magic strengths and powers. Rings have served as modes of identification - religious, political, institutional, and educational, and they have even served as pass keys into secret societies. In the 1st Century A.D., rings of thin iron were given to brides-to-be in Rome. It may not have been until 1475, in Italy, when Constanzo Sforza gave Camillia d'Aragona a diamond ring to signify their betrothal that the tradition of diamond engagement rings began. In many cultures, at various times, jewelry and jewelry beads have been used as currency. Perhaps most memorably, in relatively recent history, in 1626, Native Americans accepted too few strings of European glass beads from a Dutch immigrant in trade for the island now known as Manhattan. Three centuries later, in 1916, the renowned jeweler Jacques Cartier traded just two pearl necklaces for a parcel of land in Manhattan - where he opened his first store. Precious metals, stones, pearls, and beads have carried a host of meanings, intentions, and significance, depending on the era and the culture. Love tokens, lockets containing a portrait or snippet of hair, Victorian jet mourning jewelry, Burmese rubies inserted beneath the skin to protect warriors in battle. Jewelry has acquired, shed, and in many cases re-acquired a multitude of intriguing meanings. In that same spirit of transformation, in different regions of the world, jewelry has attached itself to different parts of the body. In India, jewelry has long reigned supreme and extravagant, ornamenting almost every aspect of a woman, from hair to nose to ankle to toe. Jewelry likewise found its way to the feet in 18th Century England, but there, it was attached to shoes instead of toes, transforming mundane moccasins into ornately buckled masterpieces. The 21st Century has renewed the ancient rave and reverence for jewelry, and perhaps even taken it to new heights, again from hair to toe - and this time, absolutely everywhere imaginable in between! Today, jewelry is available in a tremendous array of styles, materials, and price ranges, and absolutely anything goes - to an extent unparalleled in history. 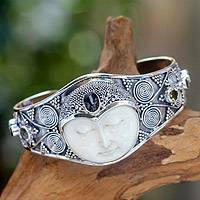 The wearer may unabashedly determine his or her favorite look: Traditional tribal jewelry, historic and period replica jewelry; gemstone, glass, beads, amber, natural or cultured pearls, dried flower jewelry; gold, silver, bronze, copper, tin, leather; fine, fashion, or costume jewelry; simple or wildly ornate, delicate or bold. Discover the look that most resonates with you (and - most importantly - enjoy!). Jewelry is considered a precious, personal, important gift. Gifted by a loved one, it will be treasured and appreciated no matter the style, material, or cost. To insure that your gift receives plentiful use, the best rule of thumb is to give something you would expect to see her wear. Does she often wear chokers? Cuff bracelets? Bangles? Drop earrings? Choose a style you've seen on her before, and you'll be in safe territory! If she wears silver, choose silver. If she tends toward gold, try gold. If you haven't seen her wear much jewelry, a simple, elegant necklace is your best bet, perhaps featuring her birthstone - or a beautiful heart! It is always ideal to give what the recipient is most likely to desire, even if that is not necessarily what you are most eager to see the recipient wear! Do remember that rings carry with them tremendous implied significance, so be sure you're intending to seriously tantalize her with future possibilities before you gift her with even a pinky ring! The trend regarding male jewelry remains: Manly and minimal. A classic watch has long been considered the essential item of jewelry for a man. Simple bracelets can also be quite manly and alluring. Cuff links, tie clips and pins, money clips, rings, necklaces, and perhaps an unadorned earring may also be considered for men, if they are already known to wear such jewelry. When considering bracelets, simple silver links and natural fiber bracelets look handsome and masculine. Likewise, necklaces of basic natural materials are considered attractive today. Remember, the simpler the better when choosing a style for a man. Natural fiber necklaces, plain silver necklaces, bead, leather, shell, wood, or seed necklaces for an outdoorsman or surfer might be apropos - nothing lengthy, nor thin and dainty. Today, we have tremendous choice in what we may wear and how we wear it. It is tempting to celebrate this freedom with great abandon, and we urge to you do so! If you do desire some simple pointers, however, we're here to help guide you! Purchasing jewelry in sets makes pairing easiest: necklaces, earrings, and sometimes bracelets and rings designed to be worn together takes the effort out of deciding what goes best with what! Fret not, however, if you wish to pair individual treasures. Simply keep in mind this most basic rule: like styles, patterns, materials, and colors go best together. Additionally, when any one aspect of the jewelry ensemble is extravagant, the other elements are best left understated. A dramatic necklace looks best with no earrings, or with small stud earrings (or matching earrings). Likewise, bold or exceptionally long earrings look best without a necklace, or paired with a delicate necklace made of similar essential elements. "The more extravagant the jewelry, the more uncluttered the clothes." This is a tried and true rule of thumb! To take it a step further (remember, these are just general guidelines): Fancy necklaces go best with simple necklines. Bold, heavy jewelry goes well with suits and pants. Delicate and feminine jewelry with breezy or elegant dresses. It naturally follows that jewelry should, and typically does, to some degree reflect the wearer's personality: bold jewelry on bold women, dainty jewelry on dainty women. When choosing jewelry, find colors that blend harmoniously with the colors of your clothes. Chokers attract the viewer's eye to the neck; longer necklaces to the bust; sparkling or dangling earrings will attract attention to the face; and of course bracelets and rings to the arms and hands. Draw attention to your favorite features! Pay particular attention when purchasing necklaces and earrings. Rather than choosing shapes that repeat the shape of your face, select shapes that contradict it (but not to extremes). If your face is round, try longer necklaces, and experiment with medium-length dangle earrings. Angular faces are best flattered with round jewelry - hoops and chokers. Men's watches, bracelets, necklaces, and the occasional earring are ideally simple and understated, and best worn where they peek out ever so subtly and enticingly from beneath clothing. A necklace looks wonderful when it conforms to the neckline of the chosen shirt. If the necklace is longer, it should fall modestly underneath the shirt, rather than drape visibly over it. The best recommendation is to treat your jewelry with great care and reverence. Keep individual items separated to avoid scratches. Even harder-than-nails diamonds can be scratched by other diamonds! Be especially careful with pearls; they are soft and damage easily. Link and chain bracelets are best stored flat (unhooked), rolled up in soft cloth. Apply perfume, makeup, and hairspray before putting on jewelry, and be sure to remove jewelry before doing housework that could damage it! Likewise, remove all jewelry before having your hair styled or colored! Be especially careful to avoid allowing your jewelry to be exposed to household chemicals, nail polish and remover, solvents and abrasives that can dull and damage. Chlorine can damage gold, so avoid wearing gold in the pool. Cuff bracelets, especially those with settings, should be opened and closed as minimally as possible. Ultrasonic cleaners can damage some gems and pearls. Such jewelry is best washed in mild, soapy water, and dried with a soft, lint-free cloth. We advise bringing your jewelry to an expert for all cleaning and repairs. A great tip for silver: As exposure to air tarnishes it, storing silver in airtight plastic bags will greatly reduce tarnishing. Keep in mind that some silver is purposefully oxidized (antiqued). Oxidized silver should only be cleaned with a polishing cloth, without silver cleaning solution. Unlike silver, pearls should not be kept in an airtight container; they can dry out. Gently wipe pearls with a hot, damp towel to remove finger and body oils, then carefully wrap them in soft cloth for storage. Magnetic jewelry has experienced a major resurgence in popularity, especially among athletes and alternative health practitioners. Magnetic energy is believed to induce a calming effect, and to increase blood and oxygen flow. Some adherents believe bio-magnetic energy can cure a wide variety of ailments, from chronic pain to cancer. Magnet therapy has been practiced since ancient times. The Greeks and Egyptians studied the benefits of permanent magnets as long as 4,000 years ago, and a 2000 BC Chinese text details the beneficial results of magnets on acupuncture points. Around the world, throughout history, people from nearly all cultures have believed that some gemstones and crystals held spiritual and healing powers. The study of such spiritual and healing powers remains strong in countries such as India, where proponents believe that certain gems and crystals, brought in contact with the seven chakra points of the body, can help release clogged and unhealthy energy, freeing the body of imbalances both mental and physical. These beliefs have also gained a considerable following among many New Age adherents, who have brought these East Indian traditions to spiritual and alternative healing centers around the world. Adherents believe that crystals heal through vibrational powers. There are examples within the realm of science that might lend credence to these beliefs. For example, piezoelectric quartz crystals are commonly used as oscillators in electronic devices (including quartz clocks, watches, and radios). Crystal healing practicioners believe that the inherent vibrational "tuning" of various crystals resonates with our bodies in various ways that can promote or speed healing, just as deep therapeutic massage, accupressure, and accupuncture are believed to have similar beneficial effects. Crystal healing practicioners suggest that specfic gems be placed on certain of the seven chakra points of the body during massage treatments and during meditation. It is often recommended that the specified gems be worn or carried between treatments, as well. Agate, ametrine, black obsidian, black tourmaline, blood stone, carnelian, hematite, fire agate, garnet, ruby, nephrite, smoky quartz, onyx. Physical, spiritual association: Adrenal glands, kidneys, spinal. column, back, hips, legs, feet; stability security, grounding, courage. Amber, carnelian, citrine, golden topaz, golden beryl, zircon. Physical, spiritual association: Genital area, reproductive organs, bladder, bowel and lower intestine; creativity, harmony, emotional balance, passion, sexuality. Physical, spiritual association: Stomach, pancreas, liver; courage, personal power, strength, self worth, transformation. Rose quartz, pink tourmaline, rubellite, rhodochrosite, emerald, green tourmaline, malachite, green aventurine, ruby, green jade, nephrite, chrysoprase, rhodonite. Physical, spiritual association: Heart, lungs, thymus gland; love, forgiveness, compassion. Aquamarine, blue topaz, blue tourmaline, blue turquoise, lapis lazuli, iolite, zircon. Physical, spiritual association: Mouth, throat, thyroid; will power, creativity, communication, truthfulness. Amethyst, blue tourmaline, sapphire, lavender quartz, sodalite, iolite. Physical, spiritual association: Eyes, brain, pituitary, pineal gland, nervous system; balance, clarity, intuition, coordination. Clear quartz, amethyst, diamond, moonstone, lavender quartz, white topaz. Physical, spiritual association: brain stem, pineal gland, top of spinal cord; spirutuality, life force. Eight metals are deemed precious: Silver, gold, and six platinum metals, including platinum, palladium, rhodium, ruthenium, iridium, and osmium. Silver is too soft in its pure state for use in jewelry, and must be alloyed with other metals (typically copper). Silver has the highest thermal and electrical conductivity of all the metals. Silver containing 80 percent silver and 10 percent copper or other metal. 95.0 silver contains 95 percent silver and 5 percent copper or other metal. Sterling silver contains 92.5 percent silver and 7.6 percent copper or other metal (a universally accepted standard, originally decreed in 1300 by England's King Edward the First). Pure gold, like silver, is too soft for most jewelry. Therefore, it is usually blended with silver or copper to achieve a more resilient alloy. Karat (abbreviated "k" or "kt") refers to the percentage of pure gold the alloy contains (as opposed to carat weight, used for measuring precious gems, with one "c" or "cr" equaling 200 milligrams). The higher the percentage of gold contained in an item of jewelry, the higher the karat weight, with 100 percent pure gold measuring 24k, and 50 percent gold alloy measuring 12k. "Solid gold" refers to an alloy that contains at least 10k of gold, and is not hollow. "Gold plated" items have been coated with gold of at least 10k. "Gold filled" actually also refers to items with a coating of 10k or greater gold, but in gold filled, the gold is mechanically bonded to the base metal, in a more durable fashion than simple gold plate. White gold is an alloy of gold and nickel, sometimes also containing palladium or zinc. These metals lend the gold a pale, platinum-like color (whereas copper and silver enhance gold's natural golden hue). The alloy of gold and metals containing iron results in gold with a bluish tinge. Rarer and pricier than gold, platinum is the finest of the precious metals. It is a silver-white metal found worldwide, typically strengthened with other metals, such as iridium, osmium, or nickel, for use in jewelry. Platinum is not measured in karats, but rather is stamped with a standardized platinum quality mark by its manufacturer, indicating the percentage of platinum contained (Pt1000 denotes pure platinum). Throughout the ages, jewelry has been designed in a wide variety of beautiful and alluring materials. Texture, as well as color and style, has typically played an important role. Natural fibers and cloth have been used in jewelry throughout history. Stones and beads of all sorts, leather, shell, feather, wood, even seeds and berries. Dating back to ancient China, exquisite lacquer jewelry can now be found in many regions of the world, especially Asia, India, and Europe. Fresh and dried flowers may have been among the first ornaments to grace the human body. Today, exquisite dried flower jewelry is available, some of the finest designs handmade in Thailand. Beads are believed to be the most ancient of personal adornments. A recent (2004) archeological discovery of beads - 41 tiny, perforated mollusk shells found in a cave in South Africa - may prove that humans began adorning themselves as far back as 75,000 years ago (30,000 years earlier than previously believed). In many regions of the world, beads have been used as monetary instruments. Christopher Columbus brought beads to the New World as gifts, and to facilitate trade. In some cultures, certain beads are believed to carry magic, protective powers. 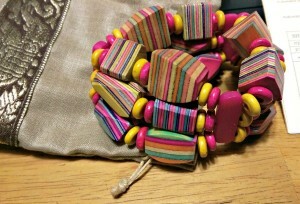 In parts of Asia, especially Indonesia, nearly colorless bamboo, stone, wood, and horn beads are favored, often decorated with bright colors. Many native North and South Americans use extensive beadwork in belts, bracelets, and clothes. Since the 10th Century, glass beads have been popular in areas of Russia, lavishly embroidered onto everything from furniture to purses. A rare, colorless variety of tourmaline. A common type of moonstone, especially popular in the early 20th century. A fine-grained, fibrous variety of chalcedony with colored bands or irregular clouding. Blue lace, moss, tree, and petrified wood agate are popular varieties. Legend holds that agate contains the power to make the wearer invisible. In the early 1700s, an inventive Brazilian priest sketched elaborate designs for an airship with agate stones serving as antigravity devices. Some believe agate can cure insomnia, reduce fever, protect the wearer from danger, and moderate passion, ensuring a long and even-tempered life. A beautiful, rare gemstone, Alexandrite is a greenish, most valuable form of the mineral chrysoberyl. By candlelight, Alexandrite transforms from green to violet red. Shile sapphires, garnets, tourmaline, and other gemstone display such color changes, but Alexandrite's transformation under artificial light is unparalleled by that of other gems. Today, most commercially available Alexandrite is synthetic, while true Alexandrite is primarily mined in the Brazilian state of Minas Gerias (birthplace of world music legend Milton Nascimento). Alexandrite was first mined in Russia, where it was discovered in 1830 on the birthday of Czar Alexander, a coincidence considered particularly consequential because the colors displayed by the stone mirrored those of imperial Russia: Red and green. An iridescent green to blue-green stone, a type of feldspar, usually set as a cabochon as it is prone to breakage in less straightforward forms. Amazonite is named after the Amazon River, where it was erroneously believed to have been discovered in the mid 1800s (the mineral then and there found was actually a form of jadeite). A hard, translucent yellow, orange, or brownish-yellow fossilized conifer tree resin, used for making jewelry and other ornamental objects. Some believe amber possesses magical powers than protect the wearer from evil. False amber, make of plastic, has made its way into the common marketplace. True amber, when slightly warmed, carries the scent of tree resin, rather than the toxic, noxious burn of plastic! A purple or violet form of transparent quartz. It is considered a symbol of sincerity and peace. Wine drinking Greeks wore amethyst to prevent intoxication, and European soldiers in the Middle Ages wore amethyst to protect them in battle. An unusual gemstone in that it is actually two types of gems in one: citrine and amethyst. The yellow-orange and violet-purple variances are ideally highlighted in the cutting process, to bring out the unique nature of this naturally blended gem. Ametrine is believed to possess all the metaphysical benefits of amethyst and citrine combined, and is believed to aid in meditation and the dispersal of negative energy. Ammonnite is the fossilized remains of a predatory marine mollusk that roamed the world's oceans for nearly 330 million years before disappearing with the extinction of the dinosaurs. Ammonnite is rarer than diamond! Named for Ammon, the ancient Egyptian god of life and reproduction, Ammonnite was known to the Blackfoot Tribe of North America as the Buffalo Stone. The Blackfoot believed Ammonnite was a sacred gift received from the gods during a great winter famine. Legend goes that a particular Ammonnite stone was given the Blackfoot by The Great Goddess, who promised that it would lead them to a significant herd of buffalo - enough animals to save the Blackfoot from starvation. When the prediction came to pass, and from then on, Ammonnite signified wealth and abundance to the Blackfoot. Although Ammonite has been found on every continent, it is the richly colored stones mined in the vicinity of Alberta, Canada that are treasured among collectors. In 1908, a member of the National Geographic Survey first announced the discovery of Ammonite in that area. Not until 1981 was a reserve discovered there with sufficient high quality gems to make commercial mining feasible. First discovered in Andalusia, Spain, andalusite is pleochroic, in other words it displays different colors when held at different angles. It shows white, red, orange, and brown, and green, even under the same light. A brittle, pale blue variety of calcium sulfate. A pale pink, deep-sea coral. Like red coral, angelskin coral is among the most desirable varieties. A volcanic glass (a type of obsidian), usually black, found in the Southwestern United States. Popular among mineral collectors but uncommonly used in jewelry, Aphophyllite is believed by some to bring love, joy, and positivism to the bearer, and to ease depression. A mineral of tremendous hardness, and, when transparent, of great beauty. It occurs in hexagonal prisms, typically in a green or bluish green color, but also yellow, pink, and white. It is a silicate of aluminum and glucinum (beryllium). The transparent, sea green variety is the variety most often used as a gemstone. The emerald is another variety of beryl, highly prized in jewelry. For hundreds of years, sailors wore amulets of aquamarine, a treasure of mermaids. The sailors believed aquamarine contained the oceans within it, and would protect them from storms. Today, many people believe aquamarine helps husbands and wives successfully solve marital problems, ensuring a long and happy marriage. Today, Africa is the largest supplier of aquamarine. A soft, common, clear to opaque gem found in many colors including green, yellow, blue, and violet. Several shimmering varieties of quartz or feldspar, flecked with particles of mica, hematite, or other materials. Aventurine can also be manufactured, in which case it is an opaque or semi translucent brown glass flecked with small metallic particles, often of copper or chromic oxide (an accidental discovery that came about when a glassmaker spilled brass filings into a pot of melted glass). A rare gemstone, primarily reddish brown and yellow to black, not commonly used for jewelry. Used as makeup by the ancient Egyptians, this rich blue, soft stone is still used in the manufacturing of high quality artists' paints, and is popular among collectors. Azurite is believed by some to clear the mind of subconscious thoughts, bringing illumination, creativity, and visionary powers. It is also believed to help the wearer better evaluate fears, desires, and undesired beliefs. Actually a group of gemstone varieties, pure beryl is yellow or colorless. The better-known green beryl is the emerald; the blue green variety is the aquamarine gem. A variety of deep-green chalcedony flecked with red jasper. Also called heliotrope. Inexpensive yet beautiful, bloodstone is often used in pendants and for bead necklaces. A rare mineral, first discovered in 1789 in Germany. White, blue, green, gray, and yellow hues, boracite contains a high concentration of the chemical Boron. Easily dulled, boracite is rarely used in jewelry. An extremely rare silicate found in Canada, Carletonite was first identified in 1971 by G.Y. Chao of Carleton University, Ottawa. Ranging in color from blue to pink to clear to white, some crystals have been cut as gems, but most Carltonite is purchased by mineral collectors. A variety of chalcedony, typically found in a deep red, flesh red, or reddish white color. It is often used for cabochons and cameos, and was employed by the goddess Isis to protect the dead on their journey through the afterlife. Carnelian has featured prominently and ironically throughout history. Today Buddhists still believe in the protective power of this stone, often setting it with lapis lazuli or turquoise for increased protective strength. Many gems display a particularly "cat's eye" luminescence, but it the gleaming form of chrysoberyl that is considered true "cat's eye." Some believe cat's eye brings protection, wealth, health, and determination. A fluorescent lead carbonate gem, fragile and generally transparent, typically found in whites and yellows. Discovered in 1976 in the mountains of Aldan, Russia, Charoite is among the rarest minerals on the market. It occurs in shades of purple with marbled white and black swirls and spots. Some believe Charoite eases difficult emotions and bolsters self-worth, spiritual development, and healthy love. A typically apple-green chalcedony often referred to as "Australian Jade." Believed to increase self-confidence, generosity, optimism, and forgiveness, chrysoberyl is affordable and beautiful, ranging in color from goldenrod to green to brown. When variegated or arranged in differently colored layers, chalcedony is called agate; and if by reason of the thickness, color, and arrangement of the layers it is suitable for being carved into cameos, it is called onyx. Chrysoprase comes in green chalcedony, carnelian, a flesh red, and sard, a brownish red variety. Citrine is a pale yellow, "lemony" variety of crystalline quartz resembling topaz. Once used as a protective talisman against evil (even to counteract snakebites and the plague), it is also believed by some to bring happiness, cleanse the body of toxins, and is used to treat such widely varied ailments as depression and diabetes. Although citrine occurs naturally, most commercially available citrine is actually heat-treated amethyst. The mineral mercury sulfide, ranging from brick red to scarlet. A rare, striking pink to red gem mostly collected as a mineral specimen. It is believed by some to help balance the heart chakra, and to ease depression, anguish, and anger. A rocklike substance formed by the calcareous skeletons secreted by various anthozoans. Coral deposits often accumulate to form reefs or islands in warm seas. 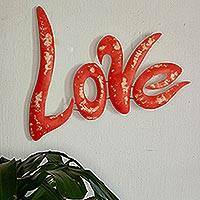 Red coral, used in jewelry, is primarily found in the Mediterranean. It is the stony axis of the stem of a gorgonian (Corallium rubrum). Coral is popularly added to bracelets, necklaces, and pendants. Especially attractive in its prismatic crystal form, creedite ranges in color from colorless to purple. Mexican mines produce the most beautiful examples. Some believers say it helps align the throat and crown charkas, and can help detoxify the blood. A popular diamond alternative, Danburite was discovered in 1839 in Danbury, Connecticut. A rare crystal of calcium boron silicate, the best specimens are now found in Mexico. The clear and light pink varieties are the most highly prized. Danburite is believed by some to serve as a powerful healing tool, removing toxins and improving relationships, and strengthen the intellect. Rarely used in jewelry, this collector's mineral was first discovered in Connecticut in 1806, and is primarily found in yellowish, green, and brown shades. The diamond is native carbon in isometric crystals, often octahedrons with rounded edges. Usually without color, some diamonds are yellow, green, blue, and even black. Diamonds are the hardest known substance. Greeks and Romans alternately considered diamonds to be tears of the gods and remnants of shooting stars. In nature, diamonds appear as rough, unattractive stones. When cut for use in jewelry, a diamond's facets are designed to best display the stone's sparkling brilliance. Although Africa is known for its diamond mines, Australia actually hosts the largest known reserves of diamonds, including the finest pink and red varieties. An average of 23 tons of diamond ore are mined for every one-carat, quality diamond. Diamonds have been a source of great intrigue and desire since 800 BC, and have eventually come to be considered a symbol of love worldwide. Historically, some believed that diamonds increased potency, prevented lechery, counteracted poison, and attracted good fortune. It has also been said that diamonds darken in the presence of guilty persons, and lighten and sparkle when held near the innocent. Unfortunately, diamonds also carry a mixed legacy, from the inhumane conditions present in some diamond mines, to the violence of the African "diamond wars," and "conflict diamonds" mined to finance controversial governments and rebels groups conducting civil wars in Africa. [Editor's note: NOVICA only offers diamonds mined in Brazil. A common sedimentary rock sometimes found as thick as several hundred feet. Formed of calcium magnesium carbonate, dolomite is used in cement, and as a source of magnesium. Dolomite ranges in color from pearly pink to white, yellow, brown, and black. A beautiful, violet blue boro-silicate mineral, sometimes made into beds, sculptures, and spheres. The emerald-green specimens of enstatite are considered the most desirable, although it is also found in brown and black. A beautiful green mineral, ekanite is radioactive, but not considered hazardous. Rare, and not widely known to the public, ekanite is an expensive gem first discovered in 1953 in Sri Lanka. A brilliant green to grass-green transparent variety of beryl. This "Green Fire" stone is highly prized for use in rings, necklaces, pendants, and bracelets. First mined by the Egyptians more than 4,000 years ago, today Brazil, Zambia, and Colombia are the greatest producer of emeralds. Composed of beryl, the emerald's deep color results from the presence of trace amounts of oxide of chromium. Emeralds symbolize fertility and rebirth, and are believed to bring good health, foresight, and good luck. Note: "African Emerald" is not actually emerald, but green fluorspar. Typically pistachio-colored, this rare mineral is believed by some to increase intuition and enhance spiritual development. Found in a beautiful spectrum of colors, from blue to green, yellow, and sometimes purple, Euclase is a little-known gemstone, primarily of interest to mineral collectors. A rare mineral composed of calcium, cerium, clorine, hydrogen, iron, manganese, sodium, zirconium, silicon, and found in pink, blue, yellow, and violet. A soft, glassy stone often referred to as "the most colorful mineral in the world." Flourite is found in a wide range of colors, with some specimens showing a veritable rainbow of colors held within a single stone. Garnet is a mineral of many varieties, differing in color and constituents, but sharing the same crystallization and conforming to the same general chemical formula. Popularly associated with a rich red color, garnets actually range widely from reds, oranges, and purples, to greens and even color change varieties. Some mystics believe that garnets contain both protective and destructive elements. The Crusaders set "protective" garnets into their armor, while in some regions of Asia "destructive" garnets were added to bullets. Today, the gem symbolizes loyalty and energy, and is believed by some to diffuse anger and protect the bearer during travels. The history of the garnet is long and complex, and dates back 5,000 years to the Bronze Age, when the garnet was already a highly popular gemstone. In Christian and Jewish history, a radiant red garnet ultimately guided Noah's ark to salvation. There are seven principle garnets: almandine, andradite, malaia, pyrope, rhodolite, spessartine, and grossular. Goshenite is a variety name for colorless beryl, the "Mother of Gemstones." A rare, brilliant, expensive, yellow, blue, green, or red sodalite mineral. Ranging in color from yellow to brown, heliodor is a variety of beryl. Hydrated Zinc Silicate Hydroxide, hemimorphite is known for its beautiful clusters of thin, bladed crystals. Its other form is a blue to blue-green stone, popular among mineral collectors. A stunning, rare green gemstone. First discovered in 1800 North Carolina. Known as the "Viking's Compass" because it reflects the direction of the sun even in overcast weather, iolite is a beautiful, violet blue, affordable gemstone. Either of two distinct minerals, nephrite and jadeite, that are generally pale green or white and are used mainly as gemstones or in carving. Jade is hard and compact, and capable of fine polish. The general term jade includes nephrite, a compact variety of tremolite, and also the mineral jadeite, a silicate of alumina and soda. The latter is the more highly prized variety. The name jade has also been given to other tough green minerals capable of similar use in jewelry and carving. Some believe that jade can help oracles divine the future. An opaque, impure variety of quartz, found in red, yellow, and other colors. When the colors form stripes or bands, the stone is termed "striped jasper" or "banded jasper." A rare green mineral. Depending on the angle of view, this gem's colors can range from brown to green to yellow. Kunzite is a pinkish lilac crystal form of the mineral spodumene. Some believe that Kunzite promotes peace and love, dispelling negative energy. It was named in 1902 after Tiffany's chief gemologist, G.F. Kunz. A rare blue mineral composed of aluminum silicate. Kyanite can be made into beautiful jewelry, although it is difficult to cut well. A sodium-rich feldspar from Canada's Labrador Peninsula, in gold and pastel, featuring an iridescent play of colors. The indigenous peoples of Labrador attributed magical healing powers to this gem. A beautiful, opaque to translucent blue, violet-blue, or greenish-blue semiprecious gemstone primarily composed of lazurite and calcite. Also known as the "Armenian Stone," and mined in Afghanistan for more than 7,000 years. Powdered lapis, mixed with oil, was the "ultramarine" color used by painter until the 19th Century. Lapis lazuli is the second most popular men's gemstone, after black onyx. A beautiful, sky blue semi-precious gem, mined in the Caribbean. Dedicated and named after Scandinavian explorer Leif Ericson, this rare mineral is rarely cut as a gemstone. A light to dark green carbonate mineral used as a source of copper and cut as ornamental stoneware. It is a lush green, earthy stone, often featuring black bands. Sometimes cut into gemstones and otherwise collected as a rare mineral, magnesite is a composite of magnesium, carbon, and oxygen. It was first discovered in Greece, in the early 1900s. It is typically white, gray, yellow, or brown. Known as the "honey stone" because of its honey color, mellite is found within coal deposits. A rare, typically translucent muted green or yellow gem, not often cut as a gem. Usually heat-treated to enhance its favorite soft pink shades, morganite is a rare, beautiful jewelry gem. This brown, green, or black mineral formed almost four billion years ago. It is extremely rare, found almost exclusively in the Nuuk region of Greenland, and very occasionally in Spain and Wyoming, USA. It is sometimes made into jewelry. A naturally occurring volcanic glass, usually black or banded, displaying shiny, curved surfaces when fractured. A chalcedony, and occurring in various colors, black onyx is the shade most typically used in jewelry. Onyx is elegant and affordable. Some believe onyx increases happiness and intuition, dispels evil, diffuses hot tempers, and cools the passions of love. Composed of hydrated silica, opals reflect light in a variety of colors. A particular shade of red is called the harlequin opal. The fire opal displays colors reminiscent of the interplay between red and yellow flame. Common opal has a milky appearance. Menilite is a brown, impure variety. Other varieties are cacholong, girasol, hyalite, and geyserite. Some believe opals improve vision and sharpen the intellect. Symbolizing fidelity, opals are also believed by some to bring trouble to the unfaithful. Opals represent purity, hope, and innocence. Classic and redolent of purity and love, pearls are a smooth, lustrous, variously colored nacre gem, primarily consisting of calcium carbonate which forms around a grain of sand or other foreign matter lodged in the shell of certain mollusks. Pearls are found in the mantle, or between the mantle and shell, of certain bivalve mollusks, especially in pearl oysters and river mussels, and sometimes in certain univalves. Pearls are of the same substance as mother-of-pearl, and are believed to be the first gem discovered. Naturally occurring, round, or nearly round pearls of high luster are the most highly prized. Today, most pearls are "cultured," farmed in seeded oyster and mussel beds. Cultured pearls can also be of extremely high quality and beauty. Legends have hailed pearls as Cleopatra's love potion, Krishna's wedding gift to his daughter, and Aphrodite's tears of joy. Pearls represent purity, modesty, and chastity, and contentedness in marriage. White, yellow, brown, blue, and sometimes light pink, pectolite is a popular gemstone first identified in Italy, in 1828. Sodium calcium silicate hydroxide, it can also contain manganese. Peridot is a beautiful olive green stone. It is much less expensive than green tourmaline. It is worn in necklaces, earrings, pendants and bracelets. The ancient Egyptians referred to peridot as the "Sun Gem." Some native Hawaiian Islanders believe that the Volcano Goddess Pele's tears fell to form these particular gems. Pirates used peridot to dispel evil spirits and protect against the "evils of the night." 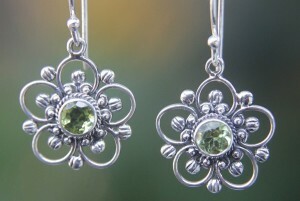 Some believe peridot can cure liver disease and encourage peaceful thoughts. A rare, typically pastel yellow mineral, first discovered in Sweden in the 18th Century. Rare, usually colorless, but sometimes yellow, brown, or pink, phenakite is a beryllium mineral popular among collectors, and sometimes used as a gemstone in jewelry. Green, gray white, or colorless, some believe that prehnite can improve dreams and memory, instill calm, and treat anemia and other blood diseases. Also known as "Fool's Gold," and typically golden in color, pyrite is composed of iron sulfide. It is found around the world. Native Americans polished larger pieces of pyrite to use them as mirrors. Quartz is the most abundant mineral on Earth. Quartz is a simple, clear stone. It is popular among New Age adherents and come alternative healing practitioners. Quartz comes in many varieties, ranging from pink to green (the green variety is called amethyst) to smoky. The "rose" stone ranges in color from pale pink to rich red to rust, and even black. Banded, or striped rhodochrosite is a favorite among jewelers, and is sometimes carved into figurines. A pinkish variety of quartz. Rose quartz is beautiful and inexpensive. A vibrant, seductive, most valuable red, pink, purple variety of tourmaline, discovered in Nigeria. "The stone of love," rubies are precious, carmine red gems, sometimes nearly violet in color. A crystallized variety of corundum, rubies are believed to have been first discovered in Sri Lanka more than 2,500 years ago. Burma is the largest mining source for high quality rubies today. Some believe rubies bring protection, especially when worn on the left side. Ancient Burmese warriors embedded in their skin, believing the gems would protect them in battle. Composed of cemented grains of quartz, sandstone is a common sedimentary rock, typically ranging in color from blond to red to brown. A clear, hard variety of corundum, usually blue in color, but found in a brilliant assortment of bright colors, with the exception of red. Most sapphires are mined in Australia, Africa, and Sri Lanka. Some believe sapphires bring clear thoughts, relaxation, good health, and protect from envy, fraud, and poison. A popular stone among mineral collectors, scheelite ranges in color from white to orange to brown, and emits a notable blue fluorescence in darkness. A beautiful, uncommon gem, serandite ranges in color from pale pink to salmon, and features a distinctive silken patina. Serandite was named in 1931, after mineral collector J. M. Serand. Sometimes found in volcanic regions, rare Sillimanite is formed from aluminum silicate, and usually occurs in brown, green, or white. The Cat's Eye variety can be cut into an attractive cabochon. A rare brown to yellow gemstone, popular among mineral collectors but rarely used as a gemstone. Named in 1832 to honor James Smithson, founder of the Smithsonian Institution, this primarily zinc carbonate compound is found in a wide range of colors, ranging from yellow to green to blue to pink to purple. Sky blue, and sometimes cloudy, sodalite is composed of sodium aluminum silicate chloride. Some believe sodalite brings the wearer endurance and great courage (it would make a wonderful, sybolic gift for an athlete!). Ranging in color from yellow to black, spectrolite, especially in its pastel forms, can make a beautiful gemstone, exhibiting a play of colors known as labradorescence. A rare, typically green gem, sphene refracts light beautifully into a vibrant range of all the spectral colors, making it appear to change colors depending on the angle of the light. Often mistaken for ruby, this brilliantly refractive red and occasional blue gemstone was first identified in Burma in 1587. It has been discovered that some of the world's most famous "rubies" are not rubies at all, but rather jewelry crafted of look-alike spinel. This dark purple stone is becoming increasingly popular as a gemstone. Some believe it is a protective and nurturing gem. A transparent variety of zoisite, typically of a striking blue. First introduced in 1967 by Tiffany & Co., Tanzanite has since become the fifth most popular gem in the world. Tanzanite is made from heat-treated green or brown zoisite. When heated to 600 degrees Celsius, zoisite transforms into what came to be called tanzanite. A yellow-brown, semiprecious chatoyant gemstone. A colorless, blue, yellow, brown, or pink aluminum silicate mineral, used as a gemstone since the times of ancient Egyptian Empire. Primarily mined in Brazil, the red and pink varieties are the most valuable, although the blue variety is better known. During the Middle Ages, it was believed that topaz could protect against the plague, improve eyesight, and instill patience, fidelity, and love. A complex crystalline silicate containing aluminum, boron, and other elements. Tourmaline's green, clear, and blue varieties are especially prized, although it is found in more shades than any other gemstone. It is sometimes referred to as the "chameleon" gem, with a single gem displaying as many as three separate colors. The last Empress of China prized pink tourmalines above all other gems, purchasing more than a ton of pink tourmaline. At her burial, she was laid to rest on a pillow carved of pink tourmaline. A group of minerals composed of calcium magnesium iron silicate hydroxide, ranging from white to green to purple. A green varient of grossular garnet, tsavorite was discovered in Kenya in 1968, and is named for Kenya's wildlife sanctuary, Tsavo National Park. Named after the location of its discovery in Greenland, tugtupite comes in pinks and reds, and is sometimes found in greens and blues. Some say tugtupite glows red amid the passion of romance. "Pierre Turquois" means "Turkish stone" in French. It may have been a mistaken, Middle Ages Europe belief that the stone originated in Turkey. The first specimens to arrive in Europe were actually most likely mined in the Sinai Peninsula or Persia. Popular in some regions for the past 6,000 years, turquoise is a hydrous phosphate of alumina, containing a little copper. It has a blue, or bluish green color. The brightest blue shades are favored. The finest turquoise comes from Persia. Egyptians mined turquoise in the Sinai Peninsula as far back as 5500 BC. Queen Zer's tomb, unearthed in 1900, revealed a turquoise and gold bracelet, one of the oldest surviving items of jewelry yet discovered. Today, turquoise is primarily mined in Arizona and New Mexico, USA; Australia; Afghanistan; and Iran. Turquoise continues to enjoy considerable popularity as a traditional gemstone in Egypt, Iran, Mongolia, Tibet, China, The United States, and Mexico. Today, in the United States, turquoise is commonly associated with Native American culture, especially Zuni and Navajo traditions, although the majority of turquoise jewelry purchased in the United States is actually made in Thailand and China. Legends hold that turquoise warns its faithful wearer of illness and danger by changing color, brings happiness and good fortune, and that it also protects one from falling (especially from falling off horses). In ancient Mexico, mortals could not wear turquoise; it was reserved for the gods and as a tribute to the gods. In parts of Asia, turquoise was believed to protect the wearer from the evil eye. Ranging in color from orange to deep red, villiaumite is composed of sodium and fluoride. Villiaumite was named after Monsieur Valium, a Frenchman who discovered the first sample in 1908 in French Guinea. Zircon is a natural stone often used as a false diamond. It is often confused with cubic zirconia, a synthetic stone. In the Middle Ages, zircon was believed to protect from diseases. Abalone is a mollusk, and a source of mother of pearl. It is the beautiful iridescent inside of the mollusk's shell that is called mother of pearl. A type of thermoplastic, often used in jewelry. Meaning to have a diamond-like luster. Reference to stones that appear to be different colors depending on the light they are viewed under. A homogeneous mixture or solid solution of two or more metals, the atoms of one replacing or occupying interstitial positions between the atoms of the other. 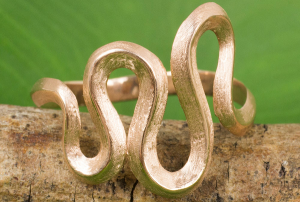 Common jewelry allows include gold, sterling silver, brass, bronze, pewter, and alpaca (also spelled alpaca, not to be confused with alpaca wool). Brass, for example, is an alloy of zinc and copper. Sometimes used in jewelry as a silver substitute, alpaca is an alloy of copper, nickel, and zinc. A lightweight, silver-white metal, first discovered in the 18th century. At that time, aluminum was more expensive than gold! A method of subjecting glass or metal to heating and slow cooling in order to toughen and reduce brittleness. An electrochemical, acid-bath/electrical current treatment for metal that changes the molecules of the surface layer (controlled oxidization) into a thin, protective, lustrous, sometimes colorful film. A translucent plastic the color of apple juice, used in jewelry. A mixture of hydrochloric and nitric acids, used to test gold and platinum. A setting of many metal claws holding the stone in place. Actually rock crystal, not a real diamond. An abrasive used to smooth metals, used in jewelry-making. Deriving its name from the 1925 Paris Exposition of Decorative Arts and Modern Manufactures, Art Deco was actually a largely North American style that influenced everything from jewelry to architecture. With an emphasis on symmetry and geometry, the Art Deco movement strove to soften the mass produced look with a somewhat more sensitive, artful purpose. In jewelry, platinum, and diamonds played a central role, often mixed with inexpensive crystal and even coral. From Art Deco, the introduction of new emerald, pear, and marquises cuts resulted, harmonious with the symmetrical themes of the Art Deco style. In jewelry, the Art Nouveau movement broke away from the solemn conventions of Victorian and Edwardian styling, a rebellion that unleashed a creative, inspired outpouring of phenomenally beautiful works of art, incorporating much of the natural world - elegant flowers, dragonflies, ferns, snakes, and lithe, sensual animal and human forms. Also with the advent of Art Nouveau came a mastery of new gold casting and carving techniques, and the widespread use of enameling. A late 1800s artistic movement, with items intentionally made to appear handmade, and with simple settings. An assay is a test of the purity of an alloy. A luminescent, star-like effect in some gemstones, reflecting light. Often used in reference to glass rhinestones or beads coated with a thin layer of metals to achieve an iridescent sheen, named after the "Northern Lights." This process was jointly invented by the Swarovski and Christian Dior companies in 1955. Japanese name for abalone pearls. Thermoset plastic first produced in the 1920s, named after its creator, Leo Hendrick Baekeland. A dense, synthetic resin, Bakelite is difficult to melt and easily colored. It quickly became a popular material for jewelry, even fostering its own counterfeits. Bakelite was initially designed to imitate amber. A stiff bracelet, solid or sometimes featuring a hinge closure. A bar fastener, where the bar is inserted into a ring, to connect two ends of a bracelet or necklace. A trade name for a colorless glass stone backed with foil. Refers to irregularly shaped, natural or artificial pearls and stones. A long pin worn horizontally. Jewelry closure where one end of the closure screws into the other, barrel-like end. Non-precious metals, including copper, lead, tin, and zinc. Translucent enameling of low relief metals to produce a sculpted surface. A long, thin, rectangular stone cut, larger than a baguette. A pearl necklace of strands that have been twisted together. Glued onto a hole-less bead or stone to make threading possible. The top of a cut stone, protruding above the edge of the setting. A bezel setting, on the other hand, is a band of metal tightened around the outside of the stone to hold it in place. A short necklace featuring flowing ornaments. Diamond, rubies, sapphires, and emeralds are known as "The Big Four", the most desirable gemstones in the world today, in that order. Irregularly shaped freshwater pearls from Lake Biwa, Japan, smoother and more lustrous than most freshwater pearls. Removing or subduing a gemstone's color with a bleaching agent. Slang term coined by rapper Cash Money Millionaires, describing ostentatious, usually diamond jewelry. A pearl that attaches itself to a mollusk's shell, so that it must be cut from the shell during removal, resulting in a flattened backside. A renaissance era hairpin, laden with many jewels. In the Victorian Era, bog-oak was carved into inexpensive jewelry and other decorative objects. It is old oak, blackened in Irish and Scottish peat bogs. Invented in the early 1900s, the bolt ring is a circular metal fastening with a spring opening, designed to attach two other links in a bracelet or necklace. A coating of plastic or another colorless bonding agent onto a porous gemstone to make it harder and richer in color. Minerals formed of plant material, including amber, coconut pearl, and pearl opal (found in damaged bamboo shoots). Link chain made of small cup-like links. Soldering with high temperature alloys to join high temperature metals. Stones cut with 56 facets, 32 above the girdle, 24 below, maximizing the amount of reflected light. The brilliant cut is the most popular diamond cut today, dating from the 1600s. Bridging the gap between precious and costume jewelry, sterling silver is an example of bridge jewelry. A pear-shaped cut with triangular facets on the top surface. An ornament of any material that can be pinned to a garment. Brushed metal, with reduced reflectivity. The shaping of the girdle of a diamond, the first step in the cutting process, determining the basic shape of the finished gem. Bubbles of gas caught in glass or resins, and sometimes in minerals. A long, thin, tube-shaped glass bead. Made from real butterfly wings, often with a picture painted on the wings, enclosed in plastic or glass. A cut with a rounded, domed surface, with no facets. Small step-cut stones for inclusion in larger designs. A relief carving on a shell or stone. Cloudy white glass, popular mid-nineteenth century. A unit of measurement introduced in 1907, .2 grams. Melting and shaping metal through the use of molds. There are many methods of casting, including the lost wax process, centrifugal, and sand methods. A simple setting, a band that arches upward. A short necklace designed to rest close to the throat, usually 13-15" in length. A simple spring clip mechanism to lock earrings in place, not requiring piercings. A plant-derived plastic, invented in 1869 by John Wesley Hyatt. Designed by the Celts in Brittany, Ireland, Scotland, and Wales, using bronze, silver, and gold. This "sunken enamel" style is achieved by first cutting designs into the surface of metal, then filling the grooves with enamel, firing it to a polished sheen. Similar, but not as delicate, as cloisonné. Jewels resting in a metal channel, held by a slight rim. Small, symbolic ornaments, usually worn on bracelets or necklaces. Decorating metal by use of hammer strikes. A stone backed with reflective foil. The cat's eye effect found in some polished stones, including cat's eye, tiger's eye, and various other stones. The cabochon cut best shows off this trait. An Irish ring, featuring two small hands clasped together. The lack of internal flaws in a gemstone. In diamonds, clarity ranges from FL (flawless), to 13 (with many imperfections visible to the naked eye). A metal prong positioned to hold a gemstone securely in its setting. The way a mineral natural breaks. A certain application of enamel to metal. First, a design is cut into the metal; then, the cuts are filled with enamel and fired to a polish. A setting that completely encases the back of a stone. Usually a cluster of tiny inclusions in a stone, making it appear milky, greatly reducing the stone's value. A gemstone surrounded by small stones or pearls. A thin, round band of metal encircling a stone, with one edge crimped over the top of the stone, and the other edge of the band soldered to the metal of the setting. Jewelry that can be assembled into one piece or disassembled into two or more pieces, so that they can be worn as one item or separately. A marine mollusk with a pearly, typically white or pink shell that is cut into beads for jewelry. A soft metal bead that, when crimped, secures the loose ends of threading material. The crown is the top part of a cut gem. Glass made of a minimum of 10 percent lead oxide, producing very clear glass, a process discovered in 1676 by Englishman George Ravenscroft. Resembling diamond, cubic zirconium is an inexpensive, manufactured gemstone, created in 1977. Pearls produced by mollusks that have been purposefully injected with bits of shell. They shell serves as irritant, compelling the mollusk to begin coating the irritant with layer after layer of self-produced nacre, in an instinctive attempt to smooth and sooth the lodged irritation. This method of "farming" pearls was invented by Kokichi Mikimoto in 1893. Stones cut into a square cushion-like shape, rounded on the edges, with facets typically similar to a brilliant cut. The inlay of soft metal into hard metal, an ancient process developed in Damascus. Tin-glazed earthenware jewelry, typically blue-on white pottery depicting Dutch scenes, usually set in silver. "Half moon" cut, where the stone is cut into a half or crescent moon. A tiara jewelry crown, worn on the head. An effect whereby a gemstone displays more than one color, especially from different angles. Rubies, opals, and various other gemstones are naturally dichroic. This quality can also be artificially added to other types of stones, as well as glass, by coating the stones with a thin layer of metallic oxides. Medallions and mass-produced jewelry are often cut with the die-stamping method, whereby sheet metal is cut and shaped by sandwiching it between two dies. A process of color-enhancing a stone by coating it with other, coloring minerals, and then heating the stone to a high temperature. A 14-15", tight-fitting, multi-strand choker. A bonded gem, featuring a bottom layer of inexpensive stone or glass, and then a top layer of gemstone. Designed to create a larger-appearing stone at a fraction of the cost of a pure gemstone of the same size. A pear-shaped cut with triangular facets on the top. A layer of crystals, like those formed inside a geode. Jewelry of this period was elegant and tended toward delicate. Filigree and bow designs were common, and diamonds and peals were highly prized. Coating one metal with another through use of electricity. Inexpensive metal is often electroplated with gold, for example, for use in jewelry. Designs are sometimes etched into the surface of metals and stones. A process of applying enamel to metal. A glassy, usually opaque, protective or decorative coating baked on metal, glass, or ceramic. Stones artificially treated to improve color, clarity, or strength through heat treatment, coatings, oiling, irradiation, bleaching, dying, etc. A narrow ring with gemstones set along the entire circumference. Similar to the newer brilliant cut, the European cut features a small table and heavy crown. Flat cuts in gemstones, glass, or plastic, designed to reflect light. Unusual stone cuts, such as heart shapes, fans, triangles, and half-moons. A new cut featuring freeform angles at the discretion of the jeweler. Jewelry featuring inexpensive stones, glass, or metals. A deep crack in a gemstone, often beginning at or near the surface. Feathers can destroy the value of a stone or increase its beauty, depending on the feather's appearance and the type of stone. A ring depicting two clasped hands. A decoration believed to have magical properties, often depicting a person or animal. A jewelry pin that looks somewhat like a safety pin, used to secure clothing since ancient times. Jewelry designed to look like real subjects, such as butterflies, animals, flowers, etc. A crack, cavity, or other inclusion in a gemstone, generally decreasing the value of a stone (but sometimes increasing it, as in moss agate or rutilated quartz). Beads or pearls strung apart from each other on a clear or nearly invisible threading material. Crosshatched lines engraved onto the surface of metal to reduce its reflectivity. An effect where light is emitted from a stone. Many stones fluoresce under ultraviolet light. A ribbon or chain that attaches to a pocket watch. The tusk of the Woolly Mammoth, an extinct, Ice Age, elephant-like animal. The remains of ancient plants or animals, often found in rocks, opals, and amber, etc., and sometimes designed into beautiful jewelry. Synthetic ivory, molded from plastic. A pearl from a freshwater mollusk, typically shaped like a grain of rice. A precious or semiprecious stone that may be used as a jewel when cut and polished. Amber, coral, and pearls are also considered gemstones. A crystal-filled rock, typically with a rounded, unattractive exterior. A Renaissance ring of two or more interlocking bands. A recessed setting, typically with engraved (especially star-like) designs around the stone. A brooch or earring featuring three pearls or stones, handing from a larger stone. The widest perimeter of a stone. The art of engraving stones, creating intaglios and cameos. A necklace or bracelet of pearls or beads of different sizes, orderly arranged from small to large in a graduated manner. Four grains are equal to one carat (a weight measurement used for natural pearls and diamonds). An alloy of 90 percent copper, 10 percent tin. An official mark indicating the quality of the metal and the manufacturer. Today, many commercially available gemstones are heat-treated to improve clarity and color, increasing the market value of the gems. Disk-like flat stones or beads, strung on a wire and then sanded to relative evenness. Native Americans are credited with developing this method of bead making. A simple, ancient fastener composed, as the name suggests, of a hook that slips into an eyelet. A solid, liquid, or gaseous particle contained within a mineral, usually decreasing the value of a stone, but sometimes increasing the value, depending on the inclusion and the type of stone. A design cut or etched into the surface of jewelry. Two mineral crystals that have self-bonded into one. Stones are often exposed to radiation to improve their color. The radiation alters the crystal structure, sometimes in a stable fashion, and sometimes not so stable (sunlight and heat can sometimes reverse the effects of irradiation). A black lacquer metal finish. The hard seeds of a tropical grass dried and used as jewelry beads. A unit of measure of the quality of gold. The higher the karat (up to 24kt), the higher the quality. A trademark for a certain method of thick gold electroplating. A ring worn beside a more expensive ring, to hold the more valuable ring securely on the finger. Typically used for large diamonds, the king cut has 86 facets. A small raised inclusion, typically found near the surface of a finished gem. The artisan who cuts and polishes gemstones. A pendant necklace with a dangling stone, named for the mistress of King Louis XIV of France. A cabochon cut featuring a stone identically cut on both top and bottom. A snap-shaped fastener, with a tiny spring that holds the lock of the clasp closed. A pendant designed to hold objects precious to the wearer. A 4,000-year-old casting method, using wax and clay to create a mold for metal casting. Acrylic resin, thermoset plastic developed by DuPont in 1937. Large, cultured pearls that develop attached to the inside shell of the mollusk, rather than freely suspended, resulting in one flat side. A shiny, metallic, semi-precious iron pyrite stone. Stones cut in an oval, but with two pointed ends. A single strand necklace, 22-23" long. A small diamond, .20 carat or less. Mesh of braided wires, used in some jewelry. Italian for "thousand flowers", millefiori glass is formed of various canes of class fused together and then cut crosswise, to clearly display each of the canes. A stone set in tiny beads of metal. Stones cut with a cushion style girdle. A stone cut with different styles of facets above and below the girdle. Molded (as opposed to traditional, carved cameos), usually made of plastic, porcelain, or glass. Vintage Lucite plastic first produced in the "Space Age" 1950s, featuring a desirable moonstone-like luminescence. The iridescent coating on the inside of oyster and various other shells. Typically jet or other black gemstone, glass, or Jappanned (black finish) metal. A crystalline substance mollusks secret around an irritant, such as a shell chip, sand, or stone lodged inside the shell. Layer after layer of nacre eventually results in a pearl. An alloy of approximately 60 percent copper, 20 percent nickel, 20 percent zinc. An ancient engraving technique possibly pre-dating the Roman Empire, where designs, cut into metal, are filled with a dark alloy of lead, silver, copper, and sulfur. A method improving the appearance of a gemstone. Mineral oil is rubbed onto the surface of the gemstone, and into any surface inclusions. A milky white to blue iridescence. A substance impenetrable by light; neither transparent nor translucent. A necklace without a clasp, usually with ornamented ends, worn by tying the ends together. A valuable, light-gray metal sometimes used in jewelry, isolated as an element by William Hyde Wollaston and Smithson Tennant in 1802, and more recently employed in the making of catalytic converts (which caused the price of the metal to rise to more than $700 an ounce). A Parure, meaning "personal adornment," is composed of three or more matching items of jewelry designed to be worn together (e.g. necklace, earrings, bracelet). A Demi Parure includes two matching items. A Full Parure includes four or more matching items of jewelry. Glass faceted to emulate the appearance of a cut gemstone. The sheen on any surface produced by age and use. A patina can also be artificially created through the use of oxidizing acids or electrolytes. Stones set very close together, ideally held by metal claws, but less expensively secured with glue. The part of a cut gemstone below its girdle. A teardrop cut popularly used for pendants, drop earrings, etc. First manufactured during China's Quing Dynasty (late 1600s), when glassmaking was introduced to the country. Initially designed to imitate porcelain, Peking Glass later evolved into a multi-layered, carved, bas-relief form, with a cameo-like appearance. Circular Celtic brooches featuring a long pin that served as a clothes fastener. Wood converted to stone through time; fossilized wood. An alloy composed primarily of tin mixed with a variety of other metals. An ancient inlay method, impressing semi-precious stones into marble or other soft stone. An 83 percent copper, 17 percent zinc alloy that looks like gold, invented in the 18th century by Christopher Pinchbeck. A method of coating one metal with another. A phenomenon whereby different colors appear when certain crystals are viewed from different directions. Appearing somewhat like stained glass, plique a jour is translucent enamel, without backing, featuring thin metal separations between each color cell. .002 grams, or 1/100th of a carat. Fine kaolin clay, fired to 2,000 degrees Fahrenheit, and coated with a decorative glaze. Pot metal is an inexpensive alloy, typically containing lead. Semiprecious stones are simply gemstones bearing less commercial value than precious stones. For example: amethyst, garnet, jade, and tourmaline are semi-precious. Diamonds are precious. A necklace, typically pearls, 18" in length. A pre-engagement ring typically set with a modest, small stone. Stones secured with tiny metal claws. Simulated crystal made from plastic. A highly faceted cut for rectangular stones. A stone created from pieces of smaller stones or crystals. The measure of how light is refracted in a gemstone or other substance. Various gemstones cut and positioned to spell the word "regard." Regard jewelry was popular in the Victorian era, and was given as a token of affection. 1940s style geometric, large jewelry. Sheet metal decorated with designs pressed into the back of the metal, so that the designed are raised when viewed from the "front. Hard glass with a tin or foil backing added to reflect light. Rhinestones are believed to have been named after the Rhine River in Germany. A white, precious, very expensive metal. A small disc-like spacer used to separate beads. A string of pearls over 40" in length. A diamond cut used in the 17th and 18th century, featuring a flat base and triangular facets. An alloy of copper, nickel, and silver, invented in the 1800s. An antiqued finish for gold. An older screw-type mechanism especially on heavier earrings, designed to encouraging the earring to sit firmly flat against the ear. Egyptian style carving in the form of the scarab beetle. The scarab was regarded as sacred by the ancient Egyptians, and kept as a talisman and symbol of the soul. A lustrous iridescent or bronze-like reflection in certain minerals. Broken glass that has been worn by sea and sand, often threaded as beads. Small, round peals less than 2mm in diameter, popular in the Victorian era. A ring carved with a symbol, used as identification for persons of rank or importance. A small hoop earring worn as a placeholder in newly pierced ears. A ring set with a single stone. Jewelry designed for tourists, as reminiscent of a certain locale. A common, circular fastening, composed of a ring with a spring opening. Gemstones impregnated with plastic to improve appearance and durability. A gem set into a metal star-shaped setting. A square or rectangular cut with many parallel facets. The color of a mineral in its powdered form. Beads coated with fine grains of ground glass or plastic. The flat, top area of a gemstone. In the state of Guerrero, Mexico, Taxco is a town renowned for its high-quality silver jewelry. American silversmith William Spratling is credited with the international popularization of Taxco silver. Spratling set up shop in Taxco in 1929, a move that soon attracted a following of other talented silversmiths to the area. A method for hardening metal or glass by heating, or heating and cooling it. A simple bracelet featuring a circumference of diamonds. The name was coined in 1987 when Chris Evert's diamond bracelet fell onto the court during the U.S. Open Tennis Tournament. Minerals that emanate a bright light when heated. A decorative bar-shaped clip, used to secure a man's tie. A decorative pin that pierces a man's tie, to be pressed into a solid backing. The tie tack secures the tie in place. A high set, six-pronged solitaire diamond ring on a simple band, introduced by Tiffany & Co. in 1886. A narrow, twisted metal necklace, worn by the ancient Celts (among other neighboring cultures). An almost clear, see-through quality; admitting the passage of light without permitting objects to be distinctly seen through it. A necklace of many twisted strands. The richly beautiful shell of the tortoise, popularly used in the1800s for use in jewelry. True tortoise shell is banned for use today. It has been replaced with plastic tortoise shell. Material that allows light to pass, but which causes sufficient diffusion to prevent perception of distinct images. Material capable of transmitting light so that objects or images can be seen as if there were no intervening material. An item of jewelry set on a spring, designed to allow the jewelry to quiver when moved. A triangular cut featuring many facets. A stone manufactured of three sandwiched layers of stone. Measurement for precious metals, including the following units: pennyweight, ounce, and pound (the latter two differing from the common measurements of the same names). Stones mechanically tumbler for a smoothing, polishing effect. Gold plated silver. Sometimes also refers to gold plated bronze. The time during which Queen Victoria ruled Great Britain. A hollow glass bead filled with wax, designed to resemble a pearl. Glass beads originally from Murano, Italy, featuring colorful glass overlays (especially roses). An earring clasp patented by Judith McCannin 1944, designed for ears too small to wear clip back or screw back earrings. Wing backs stay in place by resting above the ear lobe on the ear's cradle. Designed to fit and hug any size wrist, some of these spring-type bracelets are now designed of "memory wire," which self-coils around the wrist. A foreign fragment within a gemstone. A hard synthetic garnet used in laser technology and as an imitation diamond in jewelry. An alloy of zinc with a small percentage of aluminum and copper.